Manufactured as per the set industrial norms and guidelines, the quality range of Plasma Expressor is highly appreciated by the customers. Offered to the clients at the best rate possible, its demand is quite high. This highly praised and preferred range delivers optimally in terms of quality and performance. 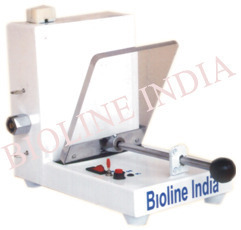 Bioline Blood Component Extractor Bio 20EX is Indent to make easy Blood Component Separation in any manner. 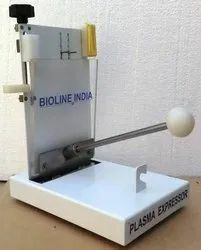 Blood component extractor Bio 20EX is suitable both for automatic routine procedures and manual operations, giving a wide and safe component separation and the operator can easily pull the bag set apart. Blood component extractor Bio 20EX is the new generation of manual plasma extractor providing the manual controlled sepration of erythrocytes (RBC), Buffy - coat (BC), platelet poor plasma (PPP) or platelet rich plasma (PRP) and platelet concentrates. 1) Specially design Hook to hang the different size Blood Bag during separation. 2) Intelligent Separator to maintain the accuracy of separation. 6) Frame and construction in powder coated mild steel. Looking for Plasma Expressor ?